On setting foot into Neo, Bournemouth’s sophisticated new dining establishment on Exeter Road overlooking the seafront, the high calibre of the dining experience on offer was immediately apparent. Bournemouth’s picturesque seaside was visible through a sweeping glass wall in the dining area, which showcased the hustle and bustle without the accompanying noise. The dining area was airy, spacious and contemporary, with attention to detail on the high quality furniture and fittings, and an attractive skylight, pouring more evening light into the room. Style and space is obviously a priority, with tables spread comfortably well apart. With a Hendrick’s Gin and tonic in hand, I ordered from the à la carte menu a twicebaked cheddar and spring onion soufflé to start. Our waiter, Dan, was friendly, relaxed and obviously an absolute pro. A beautifully presented soufflé soon arrived and was, in short, delicious. Creamy and bursting with flavour, the cheesy soufflé was rich and yet light, the perfect size to tantalize the taste buds. The salt and pepper squid that my sister Arabella ordered was a similarly tasty dish; the crispy rings of squid were cooked to perfection. 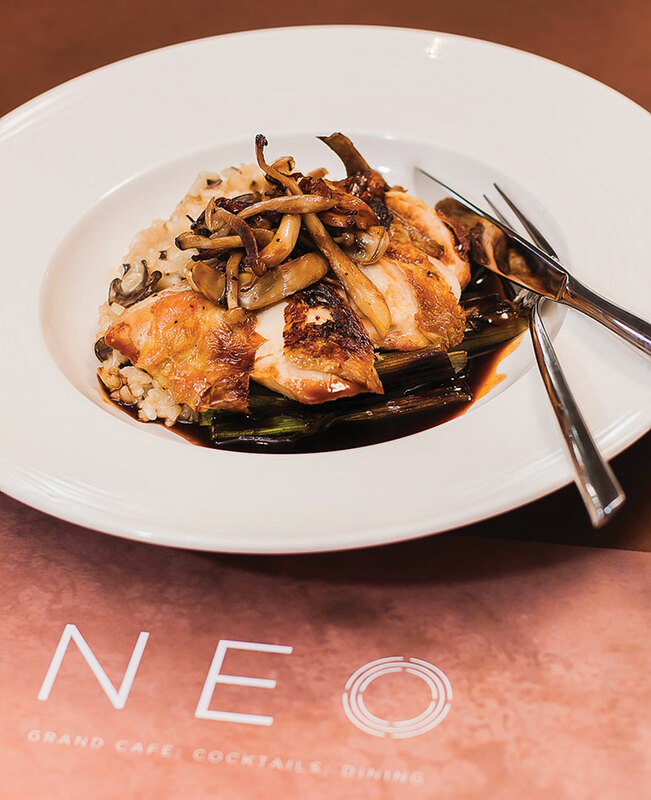 The main course of sautéed corn-fed chicken breast, with wild mushrooms risotto and charred leeks featured impeccably tender and moist chicken with a rich jus, and a generous sprinkling of mushrooms. For dessert, the prettiest plate of all: chocolate orange torte, with orange jelly, chocolate ganache, and fromage blanc sorbet, garnished with a purple flower, chocolate straw and a chocolate coin stamped with the restaurant’s name; I “wowed” out loud as it was served. The sliver of chocolate and orange torte was a delight, as was the glistening globe of creamy sorbet, sprinkled with crushed amaretto biscuits. With decadently velvety chocolate and tangy marmalade flavours, this was the perfect end to a delicious meal. Bournemouth’s new venue, Neo, is a triumph, offering high-quality food served in well-thought-out portion sizes to the discerning diner. I was particularly impressed with the charming and friendly waiters. 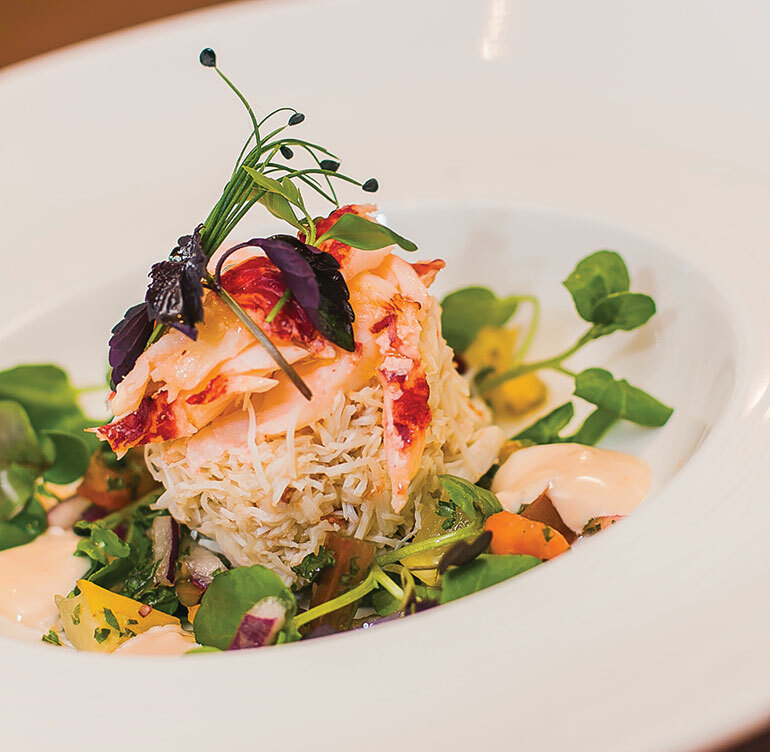 An elegant and relaxed dining experience, Neo is ideally centrally located, perfect for any occasion, from a pre-show dinner or drinks, a light snack, coffee on the terrace, a meal in the restaurant or a special celebration.